Stay productive and leave refreshed while visiting the surrounding areas of Saratoga Springs, Malta, Schenectady and Albany. Located in the heart of the Luther Forest Technology Park area, business travelers love our proximity to nearby companies, such as Global Foundries, General Electric, Sysco Foods and many more. 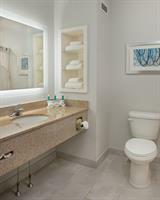 Our convenient location places you minutes from many state government offices as well as many area attractions. Start your day with our complimentary Signature "Express Start" buffet breakfast in our Great Room. Enjoy fresh fruit, yogurts, pastries, hot scrambled eggs or omelets, bacon or sausage and many more heart-healthy items to suit a variety of tastes. Don't forget to try out our make-your-own Pancake Machine! Take a stroll across the parking lot to Peddler's restaurant, serving a unique menu and providing live entertainment. Open late makes it a perfect spot for dine in or take-out meals any time of night. Nearby you will find a number of State Parks, including Saratoga Spa State Park, home to SPAC and the Hall of Springs. Head over to Clifton Commons where many local sporting events take place such as soccer, baseball and ice hockey. We’re also a short drive from the famous Saratoga Race Course in Saratoga Springs and the Times Union Center in Albany. Our staff of professionals takes pride in creating all the comforts to make you feel at home. We look forward to welcoming you to our home at the Holiday Inn Express & Suites Clifton Park.